The village of Pill, my home in North Somerset, clusters (once attractively I hear) around a deep, muddy, tidal creek formed by the Martcombe Brook rising just a couple of miles south of the village. A ‘pill’ is the West Country and Welsh name for a tidal creek – there are several pills along this stretch of the river, each identified with its own prefix, our old, ‘proper’ name is Crockerne Pill, see below for explanation. The Martcombe Brook spills into the River Avon, two miles or so south-west from where it joins the Severn. 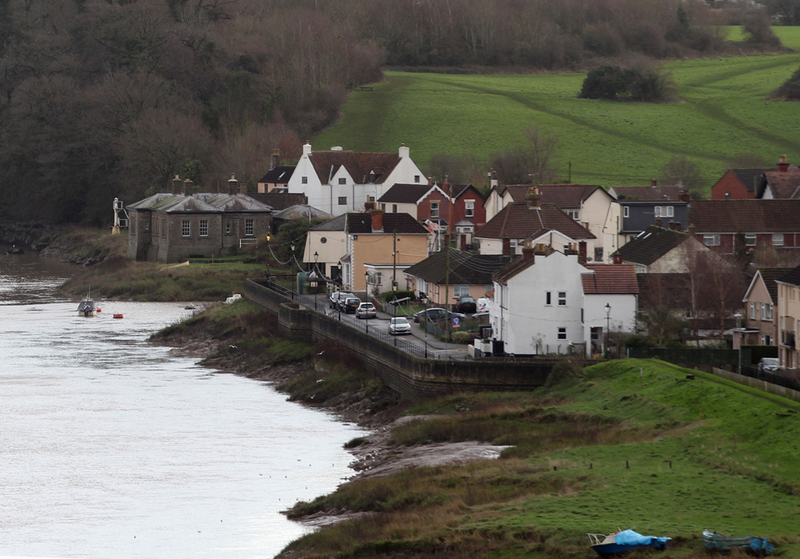 Shirehampton is only the river’s width across from us (but a different world according to local tradition – Pill was the most northerly village in Somerset, they were in Gloucestershire…) and further down river are Portbury Docks on our side and across on the right bank, Avonmouth. Beyond the stately M5 motorway bridge the Welsh hills are alluringly visible across the Severn. 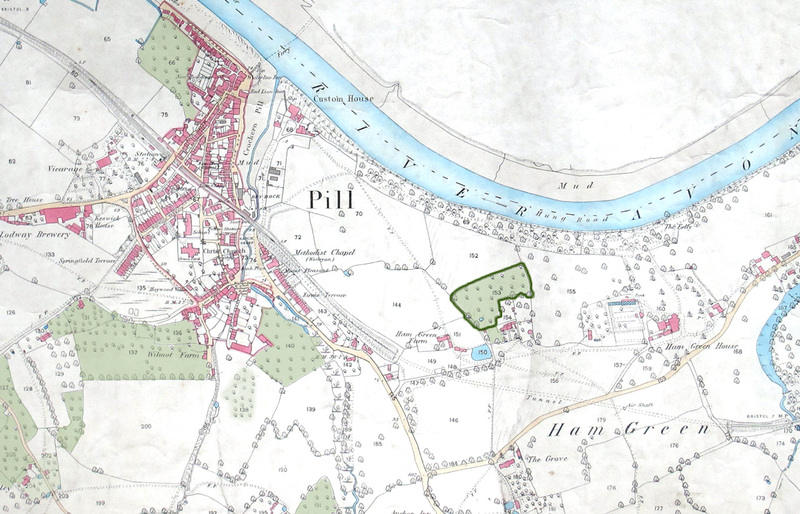 So, Pill is, or has been, all about water and it’s renowned for its historic associations with the river and the sea, not its orchards! But trade by river and sea makes its own direct or indirect impact on the land; in this area, close to Bristol’s port, the wealth acquired in maritime trade (mostly sugar) was used by local 18th and 19th century merchant-landowners to purchase or expand their estates around Pill and other nearby villages. This in turn had an affect (positive, or less so) on local communities, through employment, grazing rights, tenancies and health. In another vein, infectious diseases, often arriving onboard ships (until international air travel took over), created the need to accommodate, contain and treat the sick, so land, that was relatively isolated from Bristol’s centre, was required for building hospitals. More details on these topics that do relate directly to the orchard, follow but for those who don’t know this intriguing place here’s a nautical flavoured historic preamble before we get to the fruit! The extreme tidal range and the distance into Bristol meant ships often had to wait for the next tide to successfully reach the city so they would moor at Hung Road, a stretch of river just upstream of the village (a Road, in nautical terms is a place where ships ride at anchor while being serviced by lighters or awaiting their turn at a wharf. See this post for more detail about Hung Road). Pilots, Hobblers, Westernmen, Longshoremen and sailors lived with their families in the centre of Pill so, much of the village’s identity, history and reputation (some might say notoriety! See footnote 1 at end of this post) recall these vivid maritime connections. 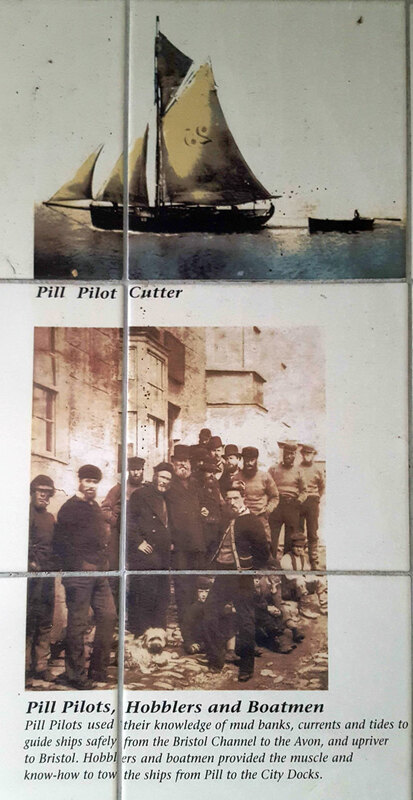 Historic images from tile mural in the centre of Pill village, designed by Stuart Cox. 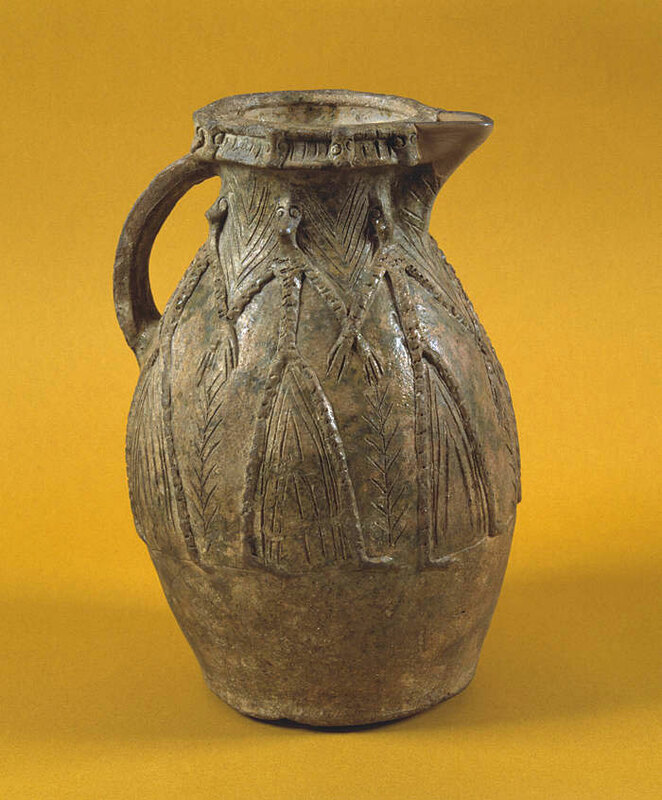 “Between the early 12th and late 13th centuries Ham Green was the centre of a major pottery industry, exporting its wares (mainly cooking pots and glazed wine jugs) to locations throughout SW England, S Wales and SE Ireland, and giving its name to the adjacent port village of Crockerne Pill.” From the booklet “Mr Bright’s Pleasure Ground at Hung Road”, The Gardens of Ham Green House, by James Russell, Avon Gardens Trust and Bristol and Avon Archaeological Society, 2000. Despite the large scale of this industry, the site of only one kiln has been found near the river not far from where Ham Green House now stands (see map below), and had long ceased activity by the 14th century. However, aside from the area’s specialities of seafaring and ceramics, maps and census details of 19th and early 20th centuries show that apart from a few woods, the land all around the village was, unsurprisingly for that time, largely agricultural, providing not just food for local consumption, but also an essential sources of employment, some men working on both sea and land. In 1841 when the population of the parish was 2199, there was roughly one man working on the land for every two in maritime related work. There were acres of pasture for sheep and cattle grazing, paddocks for horses, meadows for hay, arable fields for crops, a market garden, withy beds and coppice woods, but noticeably there were a lot of orchards – 62 were listed on the 1841 tithe map of the parish which grew apples, pears and plums, the apple types included eating, cooking and cider apples – obviously, cider is a crucial feature of West Country life! While the stories of the local seafarers are often recounted in books, magazines or media interviews, the less salty tales of people who worked on the land, and the histories of the land itself are less celebrated, so, at the risk of being viewed by proper natives of the village as an upstart newcomer (only been here just over a quarter of a century) here’s my own ‘biography’ of what is now our community orchard and its neighbourhood to make amends. 1884 map of Pill and Ham Green area showing orchards shaded in light green, the site of the present day community orchard is outlined in darker green. 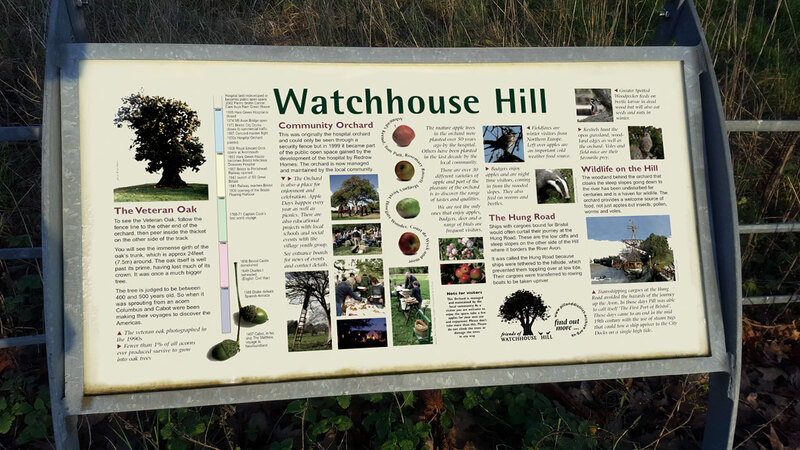 A few road names reflect the previous existence of the orchards but few remain around the village now, but today our Community Orchard, a kind of lingering, ‘appley’ echo from the past, sits on top of Watchhouse Hill – named after the Custom’s House (the Watchhouse, now a private home) located between the creek and the river bank. The hill overlooks the village from the east side of Pill Creek. and is criss-crossed by footpaths established at least 160 years ago, and the view from the flat top of the hill extends for a long way in all directions; it’s thought there may have been an Iron Age defensive settlement here. View from the M5 bridge to the village of Pill with the old grey stone Custom’s House (Watch House) crouching on the river bank and Watchhouse Hill behind. View south-west from Watchhouse Hill towards Failand ridge. Our orchard is on the site of an earlier orchard shown on the 1841 Tithe Map; it’s larger now having extended into what was then a pasture paddock, but it’s in the same location and was listed then as belonging to Henry Bright (1784 – 1869), owner of nearby Ham Green House, further east along the hill from Pill (see map above). The oldest part of this merchant’s house, an elegant, early 18th century ‘Queen Anne’ building, remains to this day but has been added to over the centuries. 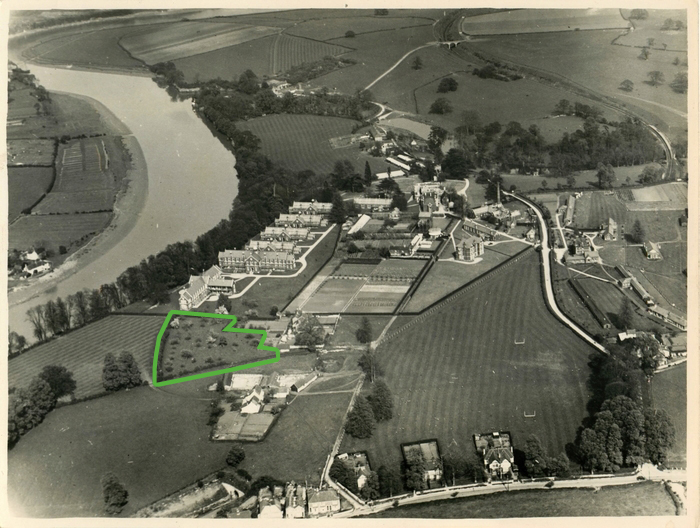 The orchard was part of the 82 acre estate which included cottages, farms, and other orchards that Henry inherited on the death of his father Richard Bright (1754 – 1840) the year before the Tithe Map record. In1800 Richard had only 9 acres, but in 1806 the Enclosures act enabled him to buy Ham Green (previously used as common grazing land by local people), and a large parcel of land that included the location of ‘our’ orchard. This is the earliest record I’ve come across for the orchard, although it’s likely the estate belonged to Henry’s grandmother Sarah Meyler in the mid 18th Century; way before then (from the 12thC) it was probably part of the Berkeley family estates, but it would be hard to find out if they had an orchard there then! The original Queen Anne style facade of Ham Green House, built in the early 18thC. Home to the Meyer, Bright and Miles families until the late 19thC, then a hospital and now the Penny Brohn Cancer Care UK centre. There is much to say about the wealthy, influential and really fascinating Bright family who occupied Ham Green House over a period of about 70 years from the early 1790s. However, apart from Henry leasing part of his orchard to a Thomas Hunt (a longstanding family surname in Pill), none of their activities can be directly related to our plot of fruit trees. But, they were landlords of much property in the area, held jurisdiction over various pilotage and shipping matters, and were apparently genuinely concerned for and active in the health and welfare of the inhabitants; the family clearly had close associations with the village, so a brief diversion seems appropriate here but there is a separate post with more detail about Bright family here. They were merchants, bankers and barristers and included MPs, a Merchant Venturer, a Mayor and a sheriff of Bristol, and a co-founder of the Bristol Old Vic. In the early 19th century, led by Henry’s father Richard, a number of family members were also highly respected amateur scientists and one of Henry’s sisters, Sarah, seems to have been responsible for producing a very early photograph in 1839, see the accompanying post about the Bright family for more about this story. Meanwhile, Henry’s younger brother (another) Richard, 1789 – 1858, was not only an esteemed geologist, botanist, artist, writer and linguist but also became an eminent doctor, developing new approaches to the diagnosis of illness; he identified a kidney disease that was named after him. He established a connection between Ham Green House and health that, by chance, continues to the present day. The Gazebo in the garden of Ham Green House, built around 1760 and providing a fine view to the Avon. 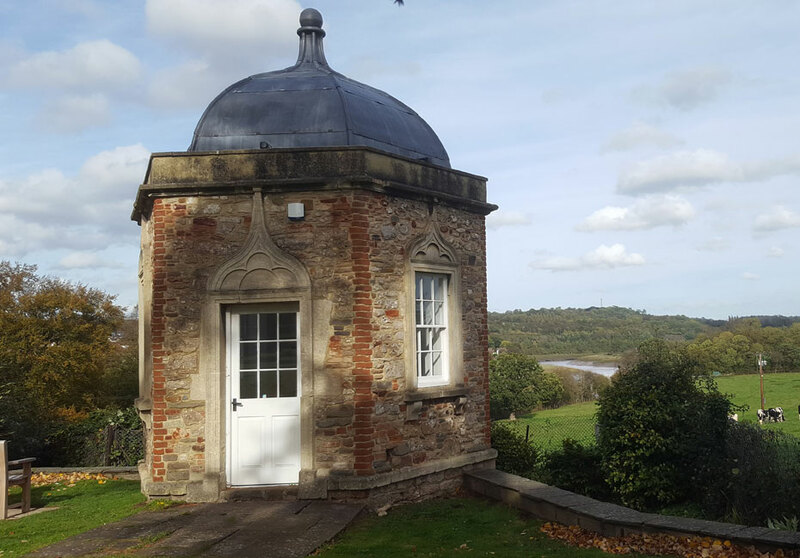 A laboratory was built onto one side of this by the Bright family in 1798 at the suggestion of family friend Humphry Davy for scientific experimentation. The Brights were well respected and remembered (by their tenants as well as those of their own mercantile background) for their kindness and philanthropy. The biography of Dr Richard Bright builds a picture of a very close family of enthusiastic and generous individuals who were genial company. 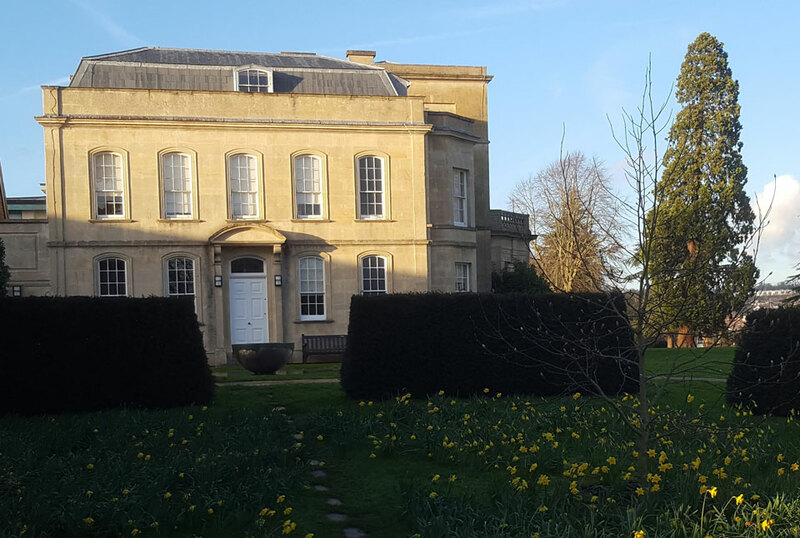 They were a wealthy family; “The Brights were know to be men of large fortune.” and this wealth enabled Richard Bright senior to expand the estate from 9 acres to 82 in around 40 years. It also allowed them to follow their scientific interests, and paved the way for Henry to become a barrister and MP, and his brother to pursue his medical training. But this fortune came at great human cost; Henry Bright’s grandfather, also a Henry, 1715 – 1777, had been a slave trader, and their prosperity was derived from their sugar plantations in Jamaica, compounded by large sums of money paid to them in compensation for the loss of their ‘human property’ (at least 640 enslaved people) when the Abolition of Slavery Act was passed in 1833 (more detail in the related post). Members of the Bright family continued to live at Ham Green House until 1847 when the it was rented; the estate was bought in the late 1860s by another well known local family, the Miles (related to the Brights through marriage), who, like the Brights had been sugar traders, but similarly concerned themselves with the health and welfare of local people, providing a clean water supply to Pill during a period of cholera epidemics. But by 1895 they too had moved away and Ham Green House and its extensive grounds, by now about 99 acres, just half a dozen miles from Bristol, proved to be the ideal site for the construction of an Isolation Hospital to serve the city, suffering at that time from outbreaks of smallpox, scarlet fever and diphtheria. There had been a ‘Fever Ship’, the Margereda (see top right of interpretation board in image below, click on the picture to enlarge) moored near Avonmouth for some years and in use for convalescence until 1914, but more capacity was needed and so roughly 40 acres of the Ham Green estate were purchased by Bristol Corporation for a new hospital to be built in grounds of the house, and included farms and the orchard mentioned above. In addition to providing beds for the city’s infected population, being near the new dock of Avonmouth (built by another of the Miles family) meant it was also “possible to treat any infectious diseases found among sailors entering the port without fear of spreading the infection to Bristol” [GH]. 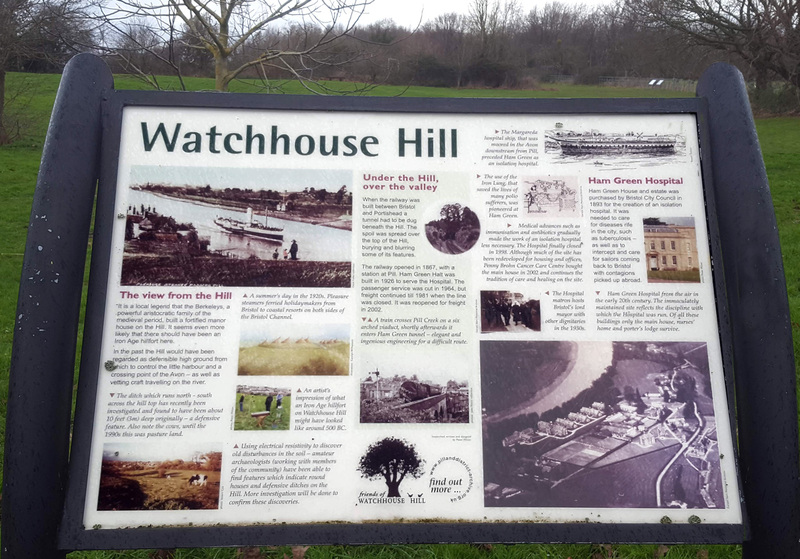 Interpretation board (designed by Peter Milner) on Watchhouse Hill with some details and photographs of its past uses. Initially patients with smallpox, diphtheria and scarlet fever were sent from Bristol to the new hospital (possibly brought by boat down the Avon to a small landing stage at Hung Road below the hospital, a relic from the Bright’s days when their ships could halt there at high tides) but as patterns of disease and rates of incidence changed over the years, victims of other infectious diseases such as Polio and Tuberculosis (TB) were admitted. TB was understandably much feared; mortality rates were high and although the horrible disease could affect anyone, many young men and women became victims and if they did survive it would only have been after possibly years in hospital. Fortunately the discovery of and treatment with antibiotics in the mid 1940s radically changed the picture – the duration of the disease reduced and survival rates increased. 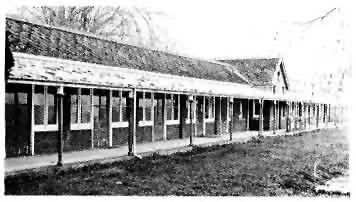 But prior to the ‘miracle’ of antibiotics the ‘Sanatorium method’ was used for treating TB – extreme rest in isolation pavilions where doors and windows were left open in all weathers including snow – though not fog, Sanatorium wards were built at the hospital from around 1911 into the mid 1920s. The other essential element in this healing regime was nourishing food, hence the associated farms and orchard. The boundaries of the orchard not adjoining the hospital were met by fields, and dairy cattle that grazed these and other nearby pastures provided milk for the patients while cattle, sheep and pigs were raised for meat too. In 1998 I interviewed some older local people about how they’d interacted with the local landscape in their childhoods and one man, Ray Buck, whose father worked for the hospital recalled living in the newly built hospital houses in the early 1930s. He told me that along with other Ham Green lads he would often help with the regular slaughter of the animals that would provide the week’s meat for the hospital: “two heifers, four pigs, four sheep and sometimes a calf.” Seventeen horses worked on the farm at this time too, and the boys would sometimes take them to nearby Blackmoors Lane to the smithy for re-shoeing. By 1949 the orchard seems to have been in need of rejuvenation, or perhaps a wider selection of fruit was required for the patients, so it was expanded to roughly the footprint of today’s orchard, see photo below, and replanted with a range of varieties of dessert and cooking apples, some pears, and maybe plums, but notably few cider apples! Older village residents would tell tales of being caught scrumping in the orchard’s heyday, but as this was an infectious diseases hospital it was strictly off limits. Children whose parents worked at the hospital and lived in the hospital houses had to be very careful not to stray into the forbidden parts of the hospital grounds; if you were caught in the wrong place your father could lose his job, and also the family home. 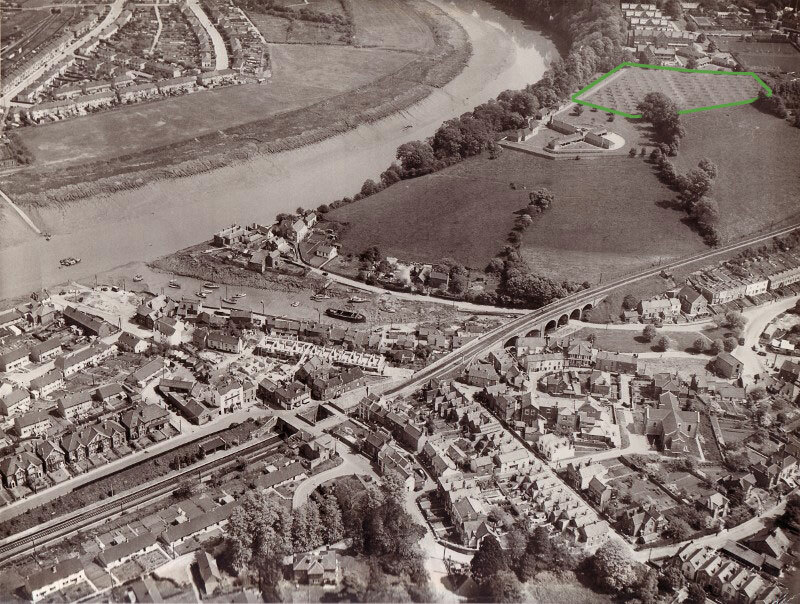 Pill village and Ham Green hospital with larger orchard, 1950s/60s. Copyright unknown, happy to credit or remove photo as appropriate; please send any requests or info via Contact form. In the 1950s and 60s the hospital became part of the NHS and “pioneered life-support machinery and artificial kidneys in the West Country” and later, cases of tropical diseases such as malaria and Lassa fever were treated up until the 1980s. However, in the mid 1980s it was announced that the hospital would close; the site was too valuable an asset for the NHS to retain when its sale could provide huge capital investment and would allow more effective use of resources north of the river at Southmead hospital. Left, the high chain link fence surrounding the orchard, and all the hospital grounds, early 1990s, courtesy Stuart Cox. Right, the park-style fence of today. 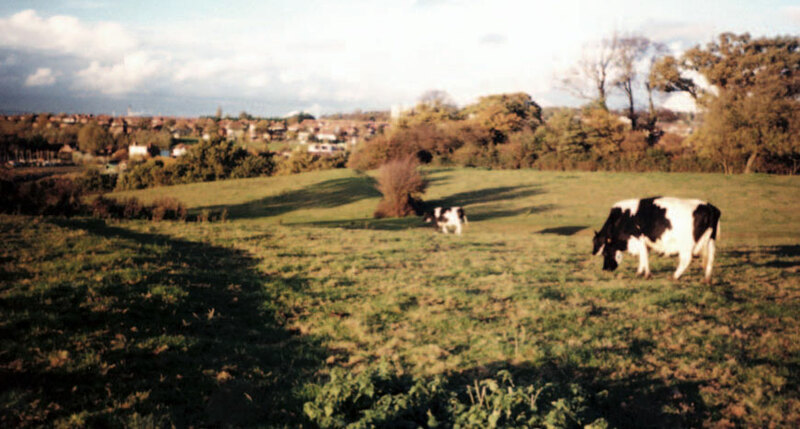 Cows grazing on Watchhouse Hill near the orchard, early 1990s. Photo courtesy Stuart Cox. In 1991, the year our family moved to Pill, despite much protesting from local and Bristol people, the hospital closed. The orchard, still technically within the hospital grounds, was abandoned and became an overgrown, lost world; cattle were still grazed on the hill for a while longer – their high, chain link, boundary fences retained the warning signs “Keep Out Infectious Diseases Hospital” for several more years. From an upstairs window in our house we could see the cattle on the hill and in April and May the wash of blossom was just visible above the wall of brambles that came to surround the orchard, so this area came to feel very much part of our new territory. View to the orchard from our house in 2016, cattle no longer grazing sadly. But in the late 1990s, as anticipated, many of the hospital buildings were demolished to make way for a new housing development while a few existing buildings were converted. Ham Green House was sold separately and later renovated, with much sensitivity, to become the Penny Brohn Cancer Care Centre, maintaining the long association of the house with health and welfare. 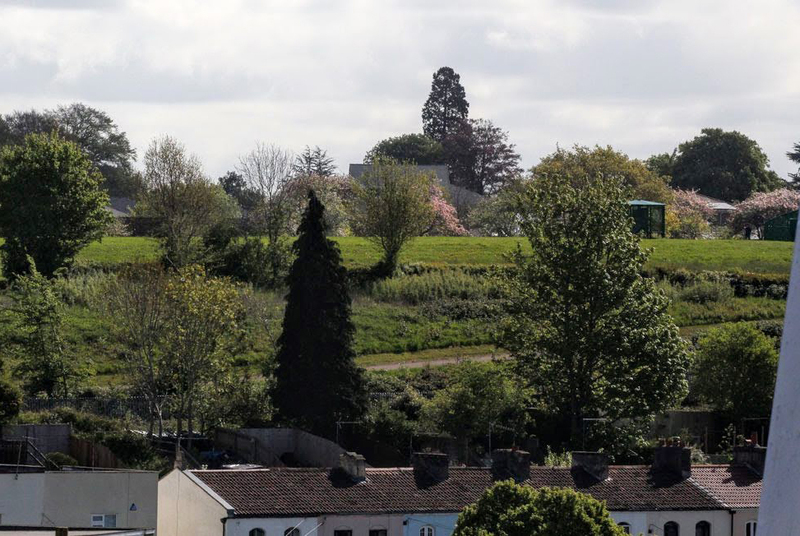 Fortunately, part of the deal with the developers of the hospital site (Redrow) led to the orchard being passed into the care of the local community. And that is the story told in the next post! “With the necessary utensils from the pastry cooks shop and the friendly assistance of some of our friends, we took leave and set out for a little place called Pill. A sort of harbour for ships five miles this side of Bristol. The place itself is not unpleasant, if it were inhabited by any other kind of people than the savages whom infest it, and are only in outward form distinguished from beasts of prey. To be short, the villains of these wretches are of so heinous and uncivilized a nature, they render the place so unlike any other part of the habitable world, that I can only compare it to the anti-chamber of that abode that we are admonished to avoid in the next life by leading a good one here. A boy of eight or ten years of age, is so well versed in the most beastly discourse, and the most dreadful sin of blasphemy and swearing as any drunken reprobate of thirty. He who drinks hardest and excels most in these terrible qualifications stands next in his fathers favour. This entry was posted in History, Place, Placescapes and tagged Bright family, Ham Green House, hospitals, orchards, Pill, slave trade, TB. Bookmark the permalink. ← Fruit, Friends and Festivities … biography of an orchard, part 2. Really interesting. I think I might need to go and explore Pill!